Marian Price was arrested on 13 May 2011 and charged with encouraging support for an illegal organisation. The charge arose from an Easter Rising commemoration in Derry city cemetery the previous month. On a blustery day, she had reached up and held the script from which a masked man was reading the Real IRA’s “Easter Message”. Three days later, Marian appeared in court in Derry where, despite strenuous prosecution objections, she was granted bail. However, she was re-arrested as she emerged from the courthouse on the basis of a document signed the previous evening by Northern Ireland secretary of state Owen Paterson and taken to Maghaberry high-security prison. She has since been transferred to a secure ward--armed guards, barred windows, bolted doors, constant surveillance--in a Belfast hospital. She is gravely ill. She could be held for the rest of her life. Paterson had concocted a scheme to trump the bail decision if it went against the state. The court hearing had been made a meaningless charade. Marian’s continued imprisonment reveals a similar contempt for justice and due process. Paterson’s document, reversing Marian’s release from a life sentence in 1980, was based on “intelligence”--information from MI5 or MI6 which cannot be made public, on the grounds of “national security”. In Maghaberry in July, Marian was further charged with “providing property for the purposes of terrorism”. The reference was to her allegedly having bought a phone which the authorities believed had subsequently been used in connection with the killing of two soldiers outside Massereene barracks in Antrim in March 2009. Marian had been held for two days and questioned about this allegation in November 2009 before being released without charge. No evidence unearthed in the interim was offered in court. She was again granted bail. But, again, Paterson’s order took precedence. Marian’s supporters believe that the Massereene charge was designed to associate her with a notorious crime that the authorities had been unable to connect her with. They wanted to stymie a campaign for her release which was attracting support from a wide range of people who found it difficult to see what crime had actually been committed at the Easter Commemoration. On 10 May this year, almost exactly a year from her original arrest, the charges relating to the commemoration were thrown out at Derry court. Told that preliminary papers were still not ready, Judge McElholm declared that every citizen was entitled to a fair trial within a reasonable period and that the prosecution hadn’t met this condition. But Marian’s imprisonment was still underwritten by Paterson’s signature. This was the third time a court had ordered her release, and the third time the Tory minister said no. Marian’s frail condition prevented her from travelling to Derry for the hearing. Neither was she able to walk to the video suite at Hydebank Prison where she was now being held to follow the proceedings on screen. Since then, the UN Special Rapporteur on Torture, Juan Mendez, and two of the North’s leading criminologists, Dr Phil Scraton of Queen’s University and Dr Linda Moore of the University of Ulster, have visited Marian. All three have called for her release, either on ground of civil rights and due process or for humanitarian reasons to do with her health. Paterson turned a deaf ear. Marian remains imprisoned without a release date or a date when she can apply for release. Marian Price, then 19, was one of nine members of the Provisional IRA convicted of planting four bombs in London, including one at the Old Bailey, in March 1973. Around 180 people were injured in the attack, mainly by flying glass. One man died from a heart attack. The bombers included Gerry Kelly, now a Sinn Fein minister at Stormont, and Price’s older sister, Dolours. Convicted on two counts of planting bombs and one of conspiracy to cause explosions, they were each given two life sentences and a determinate sentence of 20 years. Marian was freed in 1980, suffering from tuberculosis and anorexia and weighing around five stone. She and Dolours had spent 200 days on hunger strike demanding a transfer to Northern Ireland, where Republican prisoners had political status. They were force-fed three times a day for the last 167 of the 200 days--forcibly restrained and a tube thrust through the throat into the stomach and liquid nutrition poured down. The resultant trauma was a major factor in the anorexia which led to the 1980 pardon. From the moment she was arrested in May last year, Marian insisted that she had been released in 1980 on the basis of a Royal Prerogative of Mercy (RPM) which Paterson didn’t have authority to override. Paterson claimed that the terms of the pardon did allow his intervention. Marian’s lawyers repeatedly asked for production of the pardon so its terms could be checked. They were eventually informed that the sole copy couldn’t be found, had probably been shredded and at any rate had disappeared during 2010. It is not necessary to be cynical to suspect that the document was disappeared after Marian’s detention when the authorities realised that it gave Paterson no power to put her back into prison. After her release in 1980, Marian didn’t come to prominent public notice again until the signing of the Good Friday Agreement in 1998, when she emerged as one of the sharpest critics of Sinn Fein leaders who had signed up to the deal. Her Republican credentials made her a formidable advocate. Logically enough, the Northern Ireland Office will have wanted her out of the way. Initially, parole commissioners ordered Paterson to produce the pardon. Instead, on 16 December last, his lawyers argued that inferences could be drawn from other material from the period. Marian’s representatives countered that any decision to deprive a citizen of liberty “must be properly authorised [and] is not a matter for inference and speculation”. On 30 January, the commissioners declared: “The issue is a simple one. Did the RPM cover only the 20-year determinate sentence or did it also cover the two life sentences ... The difficulty is that the secretary of state has informed the panel that the RPM cannot be located; it has either been lost or destroyed.” The panel added that losing the document was “to use as neutral a word as possible... unfortunate”. The alternative explanation, that Paterson conspired to deprive a citizen of due process and imprison her indefinitely, will have struck the commissioners, drawn from the great and good, as utterly far-fetched--rather than the most obvious and reasonable conclusion to be drawn from the facts. The issues arising from Marian’s case are not specific to Northern Ireland. In the same week that Paterson rejected the court decision to strike out the Derry charge, the coalition announced a Bill giving ministers power to order the use of secret evidence--”Closed Material Procedures”--in civil cases. This was in response to cases arising from MI5 and MI6 involvement in the “war on terror”. Ministers explained that evidence in such cases couldn’t be produced in open court, for fear of endangering “national security”. “The trades union movement has led opposition to political violence over the past 40 years. We have repeatedly mobilised our members in protest against atrocities, whether perpetrated by Loyalist or Republican paramilitary organisations or by state forces. This coming Saturday [September 15th], a human rights march and rally will be held in Dublin, to demand the release of Marian Price. 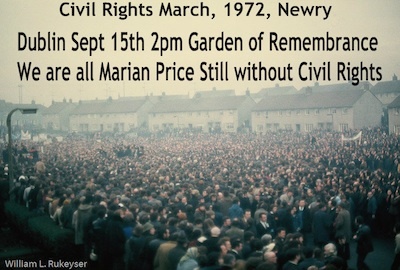 The march, organised by the Free Marian Price Dublin Committee, will assemble 2pm at the Garden of Remembrance, Parnell Square, Dublin 1, before making its way to the GPO. Speakers at the rally will include Independent TD Thomas Pringle, Independent Dublin City Councillor Ciaran Perry and Pauline Mellon of the Justice for Marian Price Campaign. Renowned protest singer Pol Mac Adaim will also perform at the event.